increase, in some respect, his fondness of himself. 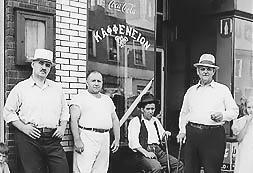 This Greek coffee house is a neighborhood gathering place for local news, gossip, and personal business. 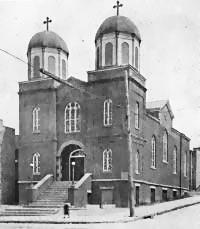 The Polish, Slovak, German, Slovene, Italians and others have their own churches, centers, and benevolent associations. They keep the old country languages and traditions alive and help the newly immigrated adjust. 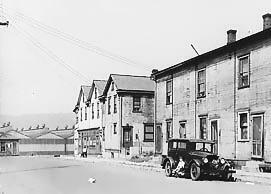 These worker's houses were constructed by American Bridge and are typical of those found near the plant. They house part of the Greek community and serve as entry level shelter. The families usually consider them short term habitats. There will be a move to a better single family dwelling once the husband is established and his income permits. Holy Trinity Geek Orthodox Church is at 3rd and Maplewood Streets. The churches are spiritual, social, and educational centers. Sunday services, church picnics, christenings, weddings, and even funerals are community events.